Temperatures across Victoria fluctuate significantly, both on a seasonal and daily basis. The temperature can be below freezing in Alpine areas or extremely hot in the semi arid environment of the Mallee. During the summer months, from December to March, pressure systems are further south and the influence of the fronts and depressions on the westerlies consequently decreases. Although Victoria normally has fairly pleasant summer conditions, occasional spells of hot weather - over 35°C - may occur when north to northweserly winds bring hot air from the interior of the country. January and February are the hottest months of the year when mean maximum temperatures range from the low 20's near the coast and on the higher mountains to the low 30's on the northern plains. Average temperatures are generally lower about the coast because of the cooling effect of sea breezes. Temperatures of greater than 40°C have occurred in virtually all areas of the state outside the Alps. Most places have recorded maxima over 43 degrees and temperatures can reach the mid forties in the northwest. The highest temperature recorded in Victoria was 50.7oC recorded in January 1906 at Mildura. Usually such days are the culmination of a period of northerly winds during which temperatures gradually rise. 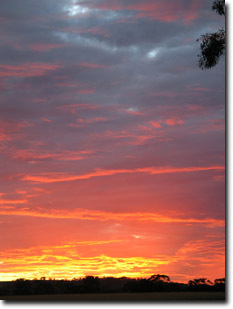 Under such conditions, severe bushfires may occur, especially if the weather in the lead up weeks has been dry. Relief comes sharply as a front crosses Victoria bringing a cool southwesterly change. Temperatures can fall by 15 to 20 degrees in an hour with the arrival of the cool change. Average minimum temperatures for January and February are mostly below 9°C about the higher mountains and range from 12 to 15°C elsewhere. The highest overnight temperatures are recorded along the Murray River and near the Gippsland coast. Winter temperatures do not show as much variation as the summer months. July is the coldest month with average maximum temperatures below 10°C over most of the Great Dividing Range and less than 3°C on the higher mountains. In winter the temperature variation from north to south is not as great as in summer. On the plains, average maximum temperatures range from 13°C near the coast to 16°C in the northern Mallee. On cold winter days, the maximum temperature may stay below 10°C on lowland areas and below 0°C on the Alps. The climatological definition of frost is the occurrence of an air temperature of less than 2.2°C, and a severe frost occurs when the air temperature decreases below 0°C. This definition is used because air temperature is measured at a height of about 1.3 metres above the ground. Overnight the ground temperature may be several degrees lower than the air temperature at thermometer height. The occurrence of frost as measured by a thermometer will not always coincide with the effects on certain plants. There are some important points to remember, however, about how frosts occur, and how the terrain can affect the incidence and severity of frost on a very local scale. Frosts are more common and severe in places into which cold air can drain during the night and in areas sheltered from the wind. A typical frost prone place is a valley bottom. Vegetation type and distribution, and the presence of water (e.g. lakes, drainage canals, etc.) also have a significant impact on frost frequency. Frosts are infrequent in coastal regions but occur frequently in most inland areas. 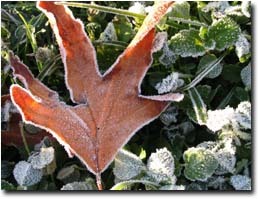 The first frosts are often recorded in March or April and can occur as late as November. Along Victoria’s west coast, the frost-free season exceeds 250 days per year. In the north west of the state, the frost-free season is generally about 150 days, and in the highlands can be as short as 50 days. North of the Eastern and Western Uplands, frosts are generally twice as frequent as places on the southern side at similar altitudes, due to clearer skies at night. High altitude valleys in the north-east are quite prone to frost and fog. The Bureau of Meteorology (external link) provides overview maps of Victoria’s mean monthly minimum and maximum temperatures. These maps are based on long term averages and developed using an analysis program which estimates climatic values between recording stations based on factors which influence rainfall and temperature (eg. altitude, topography). Source :Climate of Victoria, Bureau of Meteorology (1993). Published by Australian Government Printing Services. Commonwealth of Australia. Copyright. Reproduced by permission.